On Second Avenue in downtown Albany: You can park at the curb, but not if you work here. Compared to Salem or Corvallis, downtown Albany is a breeze when it comes to parking. The main difference: No meters. The penalties for overstaying the generous parking limits have remained unchanged for 20 years. But now an increase has been proposed. Under a deal with the city that’s been in place since 1995, parking enforcement is handled by the “ParkWise” program of the Albany Downtown Association. And Peggy Burris, the association’s executive director, has asked the city council to raise the amount of fines ParkWise is authorized to collect. Burris told me the parking patrol issues on the average of 60 citations a month. ParkWise revenue was $56,663 last fiscal year, but that included rental fees for leased spaces downtown. She didn’t have details of how much had been collected in fines alone, or for which kind of violation. (See the postscript below.) The council took up the requested increase on Monday, but before going ahead, members said they want more information on the enforcement side. The problem is that the fines are civil penalties, and some people apparently blow them off. The council heard about one downtown employee who has amassed $7,000 in unpaid parking fines. The council voted 4-2 against bringing up the ParkWise request on Wednesday, as originally scheduled. There are four kinds of possible violations. Under the ParkWise request, the price of unauthorized parking in somebody’s leased space would rise from $25 to $35. Parking for longer than four hours would cost $15, up from $5 now. A downtown employee or owner caught parking in a customer space would be hit for $35, up from $25. And sloppy parking — taking up more than one space, for instance — would also cost $35, up from $25. The amounts go up if they remain unpaid for 10 days, and again after 30 days. The proposal would continue that practice. After the council’s work session Monday, I looked for parking signs to get a photo to illustrate this story. I had not noticed this before, but the curbside customer parking signs say three hours, while the ParkWise info given the council says fines start after four hours. So they give you an hour’s grace period, evidently. Unlike outside the Capitol in Salem, where the meter patrol seems to have the ticket timing down to the second. Postscript: Peggy Burris of he Downtown Association has provided details on parking revenue. They show that of $15,040 worth of citations written in fiscal 2015/16, only $4,620 was actually collected. The rest of the annual parking income came from leasing spaces and residential, employee and other parking permits. Let’s add another $50 for parking in a bike lane. Double fines for “Albany Downtown Association” members. Seems a bit harsh. Kettle calling out a kettle? Maybe. I have a few questions. What tools does the city have to collect ‘civil penalties’. These are not crimes, but can courts still order that parking penalties be paid? It’s much harder to ignore a court order I would believe. Second, I do not see how raising the current fees would encourage the person with the $7000 in fines to pay up. I guess it may help deter occasional offenders though, rather than repetitive offenders. Lastly, I would like to hear the other side of the story of the person with the large fines. Does the person park in front of their own business and believe they should be able to? Do they have mobility issues? Are they protesting the authority of ParkWise? Have they parked in the same spot since before regulations were created and are doing it in protest? What is the reason? I do agree though that parking in downtown Albany is pretty great. I travel to Portland and there is no free parking in the downtown area in the daytime. 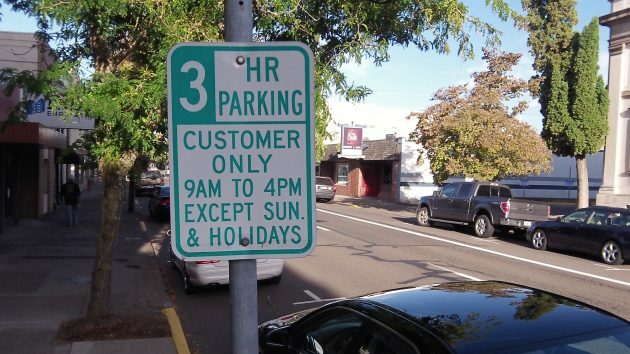 Free parking encourages business, so I do hope that the city never goes the Corvallis route of charging me 50 cents for the privilege of occasinally browsing Browsers in Corvallis. So what exactly is the problem? You go to court, you get a Judgement, when the Judgement isn’t paid, you get a Garnishment Order. Problem solved.